Highlighting the level of contempt for people receiving sickness and disability benefits, that has been cynically mounted by politicians and amplified by the media over the past few years, a medical examiner working for the private company ATOS Healthcare has been caught calling people they are assessing ‘the down and outs’ on Facebook, whilst an administrator called them ‘parasitic wankers’. ATOS Healthcare, a division of ATOS Origin, is operating under a multi-million pound private contract to the Dept. of Work and Pensions to carry out computerised face-to-face medical assessments of all people on disability benefits. 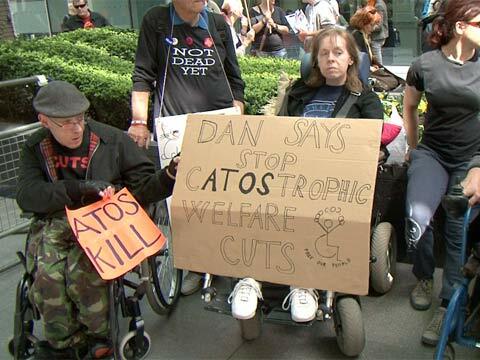 This is a programme of harassment of claimants and those on essential disability allowances which can readily be identified as being part of a as an ideological attack on welfare provision by successive governments. This revelation follows news that twelve ATOS medics are under investigation by the General Medical Council for improper conduct. This is only one part of the stuggle against NHS privatisation which obviously needs to be linked to the attack on benefits as well. A meeting about NHS privatisation will take place in Nottingham on September 22nd. In Nottingham, ATOS Healthcare runs an examination centre on Stoney St. in Hockley/Lace Market. New! 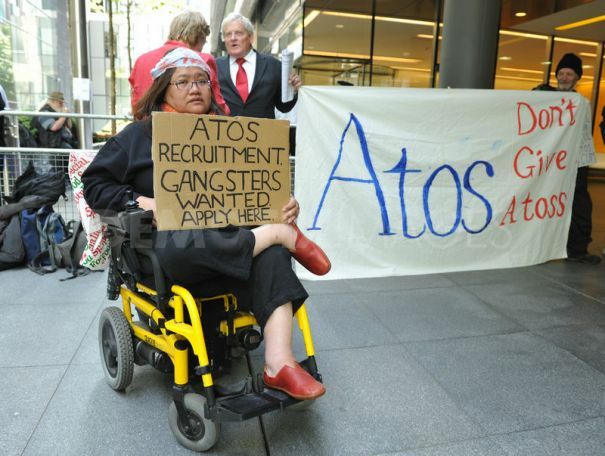 : ATOS take legal action against Carerwatch and get their bulletin taken down. (temporarily we hope). New: ATOS take legal action against Carerwatch and get their bulletin board taken down. Public meeting hosted by UNITE the union with Keep Our NHS Public. Supported by Notts TUC and Notts SOS. For-profit companies will strip NHS assets under proposed reforms, British Medical Journal, BMJ 2011; 342:d3760, 15 June 2011. Department of Health guidelines falsely inflate NHS costs, False Economy website. Notts Uncut visited Vodafone, NatWest, Top Shop/Top Man and Boots, continuing the UK-wide network of groups’ mission to highlight the massive amount of money avoided by tax avoidance schemes of corporations and money paid to bankers as bonuses after their being bailed out for billions of pounds using public money. Vodafone’s tax avoidance was sanctioned by Her Majesty’s Revenue and Customs when an official let the company off passing future trade through Luxembourg with a much reduced tax bill for past trade, allowing the company to avoid £6 billion pounds of tax after the deal was made. Top Shop/Top Man is one of government advisor Sir Philip Green’s high street stores in the ‘Arcadia group’ whose ownership was passed to his wife who is based in the tax haven of Monaco, whisking £285 million of UK tax away in the process. Boots moved it’s HQ to Switzerland recently to avoid £100m of UK tax. All daylight robbery achieved without breaking any windows but by use of the machinery of capitalism that allows money to be moved around the world whilst governments say there is no alternative to cuts in services we need. Another Sir, Richard Branson is considering a move abroad for his Virgin enterprise as the rich show their contempt for the rest of us after using the UK as their money-making playground. Read story and see photos on Nottingham Indymedia plus more photos on Facebook. “Notts Uncut will be coming together again to remind the tax avoiding banks and corporations based in Nottingham that we haven’t gone away and we haven’t forgotten what they’re up to.